In my last blog, I told the tale of the two trainee fitness instructors, who have noticeable developed in competence and confidence in the last few weeks. I also (sometimes) have the pleasure of seeing people who I train on Train the Trainer programmes in action a few month later. They too have always gone from OK/Good to Better. But (apart from getting experience), how do you make this huge step? Look for opportunities to practice, and practice a little at a time. Our trainee instructors have been taking parts of classes with the fully qualified instructor on hand. In the workplace, be willing to run PART of a session, or do a ‘double-hander’ with a colleague. That way you always have each others back if you do freeze up. Start Easy – One of the trainee instructors has been running ‘taster’ sessions…its easier to teach those who know nothing, than old-timers like me! Another is focussing on classes she enjoys the most. When you first start training, pick a topic that you feel confident in and/or enjoy, and make sure (as much as possible) that your audience will be friendly. Ask for feedback – Whether you pick people or specifically or just ask for general feedback, find out how your session went. The chances are, it wasn’t as bad as you think. Getting constructive, specific feedback about particular parts will help you to do something differently next time. Acknowledge your mistakes, but don’t highlight or dwell on them – When they first took a class, if our trainees made a mistake, they would lose the flow, apologize and start again. We hadn’t ALWAYS noticed that things had gone wrong, but they made it obvious. Now, they acknowledge the mistake, but keep control of the group by saying things like “I was just trying to catch you out”, or “I thought we’d mix it up a bit, but if you guys want to do the same as usual, that’s fine”. They then smile, and get the routine back on track without stopping…and we smile with them. In the training room it is easy to miss bits out when you are inexperienced. Don’t stop and say “Oh, I forgot to cover X”…Instead say something like “Earlier, I was going to cover X, but as we got sidetracked by Y, so we’ll cover it now” or “I’m surprised that no-one has asked me about X. I was waiting for someone to mention it, but as you haven’t, I’ll just go through it now”. This shows that you are AWARE of your ‘mistakes’, but also gives the group the confidence that you know what you are doing. If you manage people, or are involved in training others, like our facebook page, follow us on Twitter and visit the rest of our website. Why not download our free training resources too? Those of you who know me personally know that I lead a very boring life really: I work, I look after my family, and I Zumba. That truly is it! ...OK, there's an occasional glass of wine going on too, but I digress. My Zumba teacher Ellen, takes her business Heatone Fitness very seriously…. It’s not a pocket-money sideline as it is for some. She has taken the decision to train up junior instructors so that she doesn’t have to do all the work herself all the time. These ‘junior’ trainers were let loose on us for the first time a couple of months ago. They were nervous, they were quiet, they made a few mistakes with the routines, but they got through it and we had our workout. OK, it wasn’t as good as Ellen would have done, but it was OK. We didn’t feel cheated. This week, Ellen was ill so the ‘juniors’ took the class again. WOW! What a difference! They were confident, smiling, relaxed, hardly made any mistakes, and the few that they DID make they recovered well from. When you have completed your basic training and first run a training session (or take a Zumba class) you are somewhere between conscious incompetence (you are acutely aware of everything you can’t do) and conscious competence (you can do most of it, but it takes planning and concentration). It is only through practice, experience and learning to cope when things go wrong that you are able to move from conscious competence to unconscious competence, where you can just stand up and DO IT. 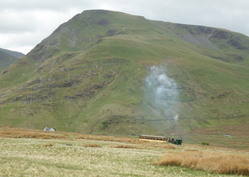 Hayley and Emma, our ‘junior’ instructors are well on their way there now. If you stay brave, and keep delivering training sessions, you’ll be there too…and sooner than you realise. Remember to like us on Facebook and follow us on Twitter to keep up to date with top training tips! Running a train the trainer workshop last week which included practicing running a version of our 'Plan your Time' Module, I was reminded how very BUSY people are at work. Most of them work very hard, yet the majority end the day having achieved little in the grand scheme of things. First line managers in particular seem to rush about in a constant blur of activity, and complain that there is simply too much to do. Maybe there is. Or maybe they need to stop. Regroup. Think. Maybe they need to sharpen their saw. So, you're pretty good at what you do, but want to be better? One of the quickest, easiest and most cost effective ways of doing that is to be a CopyCat (or as HR professionals and Management Consultants say 'Model great behaviour'). When I was young, I was very shy. I pretended to be outgoing. A year later, this act had become habit and I WAS outgoing. My husband was learning italian, but wasn't easily understood. He adopted an Italian accent (worried that this might be offensive), but his Italian was better! I started to find Zumba a little less challenging and not as sweaty. I stood next to a trainee instructor in my next class and tried to do what she did. Yep - that was more of a workout! Role models are all around us. Modelling (or copying) their behaviour is a very easy and effective way of going from good to better, as its often just small changes that we have to make. We already have the basics. So whether you want to be more assertive, be a better listener or have a difficult conversation, just for a moment 'prentend' to have the qualities and skills you admire in another (don't have a personailty transplant!) and you may surprise yourself with what you can do simply by allowing yourself to not be entirely yourself. So, its A Level results day. No doubt there will be the usual cry of "They're getting easier" (which has been going on since I did MY A Levels more than 20 years ago by the way), but whether they are or aren't is a side issue. The fact is, the students have worked hard to achieve the standards that were expected of them. they should be congratulated for that. If (with hindsight) somebody somewhere declares the standards weren't high enough, that's NOT the fault of the students. Not clearly communicated - Employees do what they THINK is required, and only when it is too late do they find out if it was right or not. Not defined in the first place - Employees are expected to guess, leaving huge inconsistencies and managers in a constant state of fire-fighting. Set at the wrong level - What was good enough 10 years ago is unlikely to be good enough now. The world is becoming more competitive and we can no longer do the same things in the same way and expect to get the same level of success. Alternatively, if you set the bar too high, people will just 'drop out'. So if your team isn't delivering what you think they should, check out the way that you define, communicate and support the goals and standards you set. Good performance management starts and ends with that clarity. Now spring is at least trying to make an appearance, I'm trying to lose my extra winter layer. One of the ways I'm doing this is to take 30-45 minutes out of my day and go for a cycle ride. I don my bum bag and cycle helmet and off I go. When an aquaintance spotted me today, she commented that I was being "very good" wearing my helmet, even though I wasn't with my kids (and therefore setting the example). My immediate thought was "Why wouldn't I?" Yes, my helmet isn't very fashionable. Yes, it makes my hair sweaty, but what's the alternative? I look a lot less silly in my helmet than I would with a head injury. b) explaining to YOUR manager why YOU allowed poor performance to continue and bring about unacceptable results? Whilst neither may be preferable (unattractive helmet or brain injury), I know which of the two evils I would go for. If you or your staff lack skills or confidence in having those difficult conversations, our Power Hour training sessions on Managing Underperformance and Giving Feedback may help. This week I got involved in a great Twitter debate about performance management. It soon became clear that performance management means different things to different people. It is a phrase often used to describe all of the things below... and no doubt more! 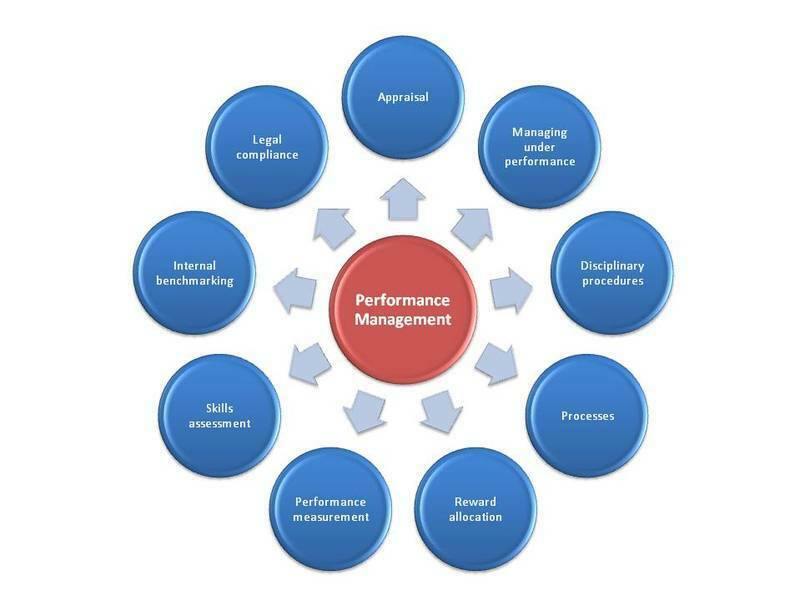 One of the few things was almost universally agreed during the #nzlead debate was that 'Performance Management' is an inadequate term. It encompasses ALL of these things, but people often fixate on just one. b) the best of their ability. It is a practice, not a process. The processes and paperwork that are so often associated with performance management (and universally loathed by managers) are just things that are put in place to structure, standardise and measure the outputs of the act of managing people. Most performance management problems most organisations face are, in my experience, managers failing to manage their people. They can't or won't have difficult conversations about poor performance: they don't see the need to stretch their good performers or recognise those people who contribute well to the business. And HR departments find it easier to focus on tweaking the process rather than address the real problem: Managers reluctance or inability to manage their staff. That's why in our Performance Management bundle (which comprises 7 bite-size modules for just £150!) focusses heavily on the people management skills line managers need to manage performance EVERY DAY as part of normal operations. Until performance management Is accepted as part of every-day managerial duties, debates like the one I was involved in will continue to rage. I'm in the middle of another run of Train the Trainer Courses. Managers within the business come along to learn basic training skills so that they can deliver our bite-size training sessions with confidence. As part of the 2-day workshop, they practice running two sessions: One on giving feedback and one on coaching. This is partly because feedback and coaching are very useful skills to have when training (and it saves me having to cover them separately), but also because they are quite generic topics that managers tend to know something about. But, a strange thing happens when we reflect on the workshop and identify the most useful aspects. Up to a half of delegates say that the feedback and coaching sessions were the most useful parts of the workshop! Now, when I dig deeper, some people say this because they found practising running a training session and getting feedback was invaluable. Others say it was learning about feedback and coaching itself that was most important. At first, I thought this was a bit worrying - here are mid and senior level people who are learning (really quite basic) feedback and coaching skills that they have allegedly been trained on in the past. Then, I started to analyse WHY. It is one thing to 'understand' - they all understood the benefits, models and concepts. It is another to put it into practice on a regular basis, and another still to teach someone else. In the medical profession, they use a simple 'read it, see it, do it, teach it' approach to surgical procedures. It is only when the trainee is good enough to teach others that they are allowed to complete procedures by themselves. When you know you are going to have train someone else, you naturally drill a little deeper into what it is you are doing. If you are the trainee, you accept what is given, and are often happy to get by with the minimum you can. When you are the trainer, you need to know more. So when these managers realised that they had to provide TRAINING on this subject that they thought they knew, they suddenly took it very seriously. They really thought about good and bad examples. They really had to understand and spot 'what good looks like'. They had to identify WHY some feedback was better than others. They had to give feedback on the role plays, and suggest alternatives. 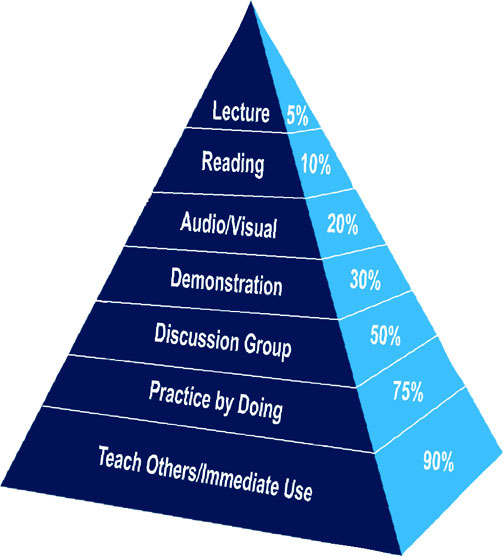 The training retention pyramid shows that the more interactive the training is, the better the retention. That is why any trainer worth their fee will use brain-friendly training techniques and get people involved. But if people have to train others, or apply those skills immediately, the retention is incredibly high, as much as 90%. So, when you train managers to deliver training, you are DOUBLY investing in the skills of your workforce: The managers take their skills to a new and improved level and retain the vast majority of what they are training. Those participating in an interactive training session will learn and retain the core messages and basic skills, that they can apply (and are more likely to apply because their managers now what good looks like, and don't want to see their effort being wasted). The first was for a specific piece of electrical kit. I found it on the manufacturers website and went to buy it. However, I couldn't just 'buy' it, and had to create an account, which then had to be verified, only then I could log in, and THEN I could begin the purchasing process. I didn't. I got bored and bought the same thing via ebay using Paypal. No fuss. The second was a DVD. I went to one popular internet store and clicked to buy... but then there were dozens and dozens of choices about which merchant to choose. I didn't have time to look at each of these offers so guess what? I aborted and went to their rival. Sign in, input credit card details, job done. I guess that's why I've never EVER worked for the public sector...they overcomplicate what should be a straightforward matter. I understand that tendering may be the right approach if you are spending tens of thousands of pounds, or looking for a long-term relationship, but for one-off workshops, small projects and purchasing training materials it feels like over-kill and I just walk away. I assume that I am not alone in this mindset. That's why you need nothing to buy our training materials apart from an email address. A paypal account or credit card is helpful, but we are happy to invoice. You don't need to create an account, you don't need to buy a licence, simply buy what you want, have it instantly dowloaded and use it to deliver great training. Plus to make it even simpler, our prices are transparent (even for our live sessions and Train the Trainer workshops) - there aren't many training providers who make their fees public. In fact, things are SO simple and straightforward I've had quite a few conversations with people who are looking for the 'catch'. There isn't one. So...our training materials and modus operandi and short and simple, and we think our customers appreciate that.